With the re-release of Wyeast's Roeselare Blend (for 3 months as part of the summer VSS releases) I though I would post my only experience with it (even though I have yet to taste the beer). Roeselare Blend is supposed to be an approximation of the yeast/bacteria mix that Rodenbach uses on their beers (the same blend was at one point provided to such small brewers as De Dolle). It is supposed to give a solid acidity and interesting flavors without being as pungent as the lambic blend. I haven't found the actual strains in the blend, but there is Brett (probably lambicus) and lactic acid bacteria (most likely Lactobacillus and not Pediococcus). There is also regular old Saccharomyces (California Ale yeast according to some people), but I thought it was a good idea to pitch my own primary yeast so I would not be under pitching (I figured with all that bacteria/Brett in the smack-pack the yeast would at a low count and stressed). For more info on the the piece of oak jammed into the top of the carboy check out this. First rest temp a few degrees higher than intended. Fly sparge, with great efficiency 6.75 gallons of 1.058 runoff collected. 2 year old hops 3.3 AA listed, adjusted down to 2.5 AA. 1/2 tsp yeast nutrient added with 15 minutes left in boil. Boil off went faster than expected so I ended it 20 minutes ahead of schedule, next time collect more wort. Pitched washed cake of 530 pitched from dubbel sugar experiment when wort was chilled to 69. Put into fridge at 62. Nice thick krausen by the next morning, so I dropped the temp to 60 to lower ester production and limit attenuation. The next day the blow-off had overflowed, so I dropped the temp to 58 to slow production. 8/14/06 Gravity down to 1.038 (49% AA), higher than I expected. Sweet and fruity flavor. Temp raised to 65 to see if I can wake the yeast back up a little bit. 8/19/06 temp dropped to 60 to get yeast out of suspension before racking. 8/20/06 1.026 (new hydro adjusted down .004 due to cold water reading) Still a bit of crap in suspension, but I racked anyway. Topped up with 1 gallon of filtered water and put into 5 gallon glass carboy with smacked (but not swollen) Roeselare blend and topped with the oak chair leg, toasted and soaked/boiled, hopefully this will transfer oxygen into carboy, let co2 out and impart flavor I cooked it at 300 for 30 minutes to sanitize and then wrapped with Teflon tape and tapped into place with a rubber auto mechanic mallet. It took a few tries to get the wood in tight enough to stop foam from escaping around it, but eventually foam was coming out the top of the wood. Wood approximately 13 sq in of surface area contact, .5 oz oak beans has 16 sq in contact. Fridge adjusted to 64 degrees for long aging. 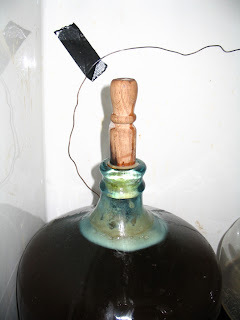 10/29/06 I managed to crack the neck of the carboy while putting the wooden peg back into the carboy. The damage was minimal so I just the neck back together. 12/24/06 Looks pretty good, crack hasn't developed and the beer still looks good. After a prolonged secondary I plan to add sour cherries to 2 gallons, dry hop 1 gallon with Amarillo/Cascades like New Belgium's Le Terroir, and leave 2 gallons straight. 8/05/07 Planning on bottling some of this next week. I bought 4 lbs of blackberries today and put them in the freezer, planning on adding most of them to half of this beer. 8/12/07 bottled 2.5 gallons aiming for 2.2 volumes of CO2. The other half was racked onto the 4 lbs of blackberries for extended aging. The sourness seems a bit tame at this point. 9/13/07 The carbonation increases the perception of sourness, this is turning into a really solid beer. 12/29/07 Bottled the blackberry half with 1/3 cup of table sugar. Just took a small sample of this one when I was back in MA a few weeks ago. It is coming along beautifully, it is a nice and clear amber-red with a mild lactic sourness and caramel backbone, little to no funkiness or acetic acid at this point. To boost the acidity I took it out of the 65 degree fridge and left it at ambient temps, hopefully the warm summer temps will kick the bacteria into gear. I plan to bottle some and add fruit and dry hops to different portions in August. Mike, what did you use the slurry from this beer (and the other Flanders Red) for? I don't think I did anything with the slurry from this one. The other one was a starter for a wine barrel of Flanders Red, so the cake went into the barrel. Can the Flanders Red slurry be used for fermenting other styles, like Wee Heavy or RIS? You could certainly ferment any sort of wort with a mixed slurry, but it wouldn't end up anything like the base beer. I've done sours based on saisons, wheat beers, Scottish, stouts, brown ales etc... pretty much any base beer can make a good funky/tart beer. Although I'd avoid really hoppy beers. When you rack onto the blackberrys how do you prepare the berrys? I am thinking of adding berrys to a sour (I really want to in fact) but I am unsure how I would filter the seeds for berrys. Any tips? I find the easiest way to deal with berries is to freeze them first. The ice crystals rupture cell walls and allow easy access for the yeast and bacteria. When you are ready to put the beer onto the fruit, put the fruit into a sanitized carboy, allow it to defrost, then rack the beer onto it. I've never had issues with seeds, they stay in the fruit pretty well, puree is much tougher to deal with. "I haven't found the actual strains in the blend, but there is Brett (probably lambicus) and lactic acid bacteria (most likely Lactobacillus and not Pediococcus). There is also regular old Saccharomyces (California Ale yeast according to some people),"
according to http://www.wyeastlab.com/rw_yeaststrain_detail.cfm?ID=194, "Specific proportions of a Belgian style ale strain, a sherry strain, two Brettanomyces strains, a Lactobacillus culture, and a Pediococcus culture produce the desirable flavor components of these beers as they are brewed in West Flanders. Propagation of this culture is not recommended and will result in a change of the proportions of the individual components." Thankfully, yes they've give a more complete look at the strains in the blend since I did this post (nearly six years ago). Still doesn't say specifically which Brett strains (their B and L I'd guess). Down to my last bottle of the plain, sorry to see it go sometime soon. If there is an ale and sherry strain, is it entirely necessary to have a primary on sacch? What are your opinions? Can I throw 2 packs of roeselare (into 5 gallons) and let is go from there? Do you think you could get that desirable funk and sourness? Also any comments about oak cube advice on this one? Thanks! If the pack is really fresh, you could likely just pitch it directly and be fine. With a beer that I'm waiting for so long on, I'd rather have the assurance that something will start fermenting quickly (although now I usually pitch the Sacch and souring blend together). You can start with an ounce or so of steamed French medium-toast oak when you go to secondary. If the flavor isn't strong enough when you get close to bottling, you can always add more! Coming up on ten years on this batch, opening the last bottle soon! 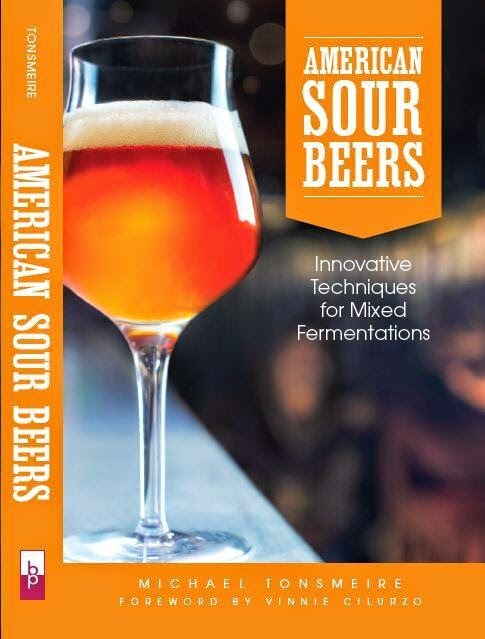 I followed Jamil Z recipe in brewing classic styles book. Almost exactly the same as your but less Munich Malt and more Pilsner and Vienna, same speciality grains as your recipe. I think your recipe might be Brewing to Style podcast version of Jamil Z. 's recipe. I fermented with strait Cal Ale yeast, WLP001, for 4 days then added Wyeast Roselare Blend and transferred to secondary after two weeks. The secondary is a 5 gallon glass EVO 2 big mouth bubbler with a spigot. I thought this would be easy to take samples from without exposing to oxygen. After 13 months of aging I finally got brave enough to sample. It is mind blowing awesomeness. I like Rodenbach Grand Cru but this is so different. I get a apple cider and sweet tarts taste that is so deep with complexity i find a different flavor with every sip. The pH is down to 3.5 and i did not take a gravity reading but it seems very dry. I am going to keg 2.5 gallons as is. I am brewing a new batch to bend with the other 2.5 gallon 13 month batch. My question is how do I go about adding canned Oregon whole red Tart Cherries in water to the blended batch. Rack the 13 month old batch on the cherries or the New batch after primary (~1 month) fermentation? I am so surprised how well it taste un-carbonated after 13 months I hate to screw-up any of this liquid gold. How would you proceed? Yep, I brewed this before Brewing Classic Styles came out. Glad yours soured better than mine. I've long since sworn off a clean primary fermentation for sour beers if all I'm adding is commercial bugs. The young beer will be able to ferment out the sugars in the cherries more rapidly. Flavor-wise I can't think of a reason adding it to one or the other would matter.